'The Big Bang Theory' Recap: Raj Is Actually a Character! ‘The Big Bang Theory’ Recap: Raj Is Actually a Character! S5E20: Raj has always been a problematic character for The Big Bang Theory. On top of never really knowing what to do with him in the first place, the show has grown lazier and lazier with the guy throughout the years. Often times, he’s just shoved off by the writers and turned into an easy punchline that is something like, “Hey, he has a funny accent! Jokes!” Moreover, there’s always been a hindering indication that he is gay, something fans of the show talk about often, but Big Bang never has put this question in the spotlight. Both of these facts are frustrating, because we all can agree that Raj is a sweet guy. He clearly has a good heart, wants the best for his friends, and has all that other warm and fuzzy stuff that makes up a good person. But when Raj isn’t given anything substantial beyond surface level crap, it’s not only hard for the audience to see him as a complete character, it’s also very difficult to care about him. What this all means is that, typically, episodes that feature him aren’t very good. That’s why I was happy with tonight’s “The Transporter Malfunction.” Big Bang finally did an episode about Raj that not only gave his character a little bit of depth, but did so without, frankly, sucking. Plus, we got some more maturity from Sheldon, which was a fun continued theme of this season. Meanwhile, Sheldon is mad at Penny because Penny eats too much food from their apartment. At first, this was our weekly “Oh, Sheldon you crazy” storyline, but it quickly turned into something outside of the ordinary. Penny recognizes that she does probably overstep boundaries, so she gets the Sheldon and Leonard each a limited edition Star Trek Transporter from the seventies as a thank you. Both Sheldon and Leonard are absolutely tickled. And I must say, even though this was an example of the general “nerd” stereotypes the show often relies on a bit too much, their squealing reaction gave me a nice belly laugh. 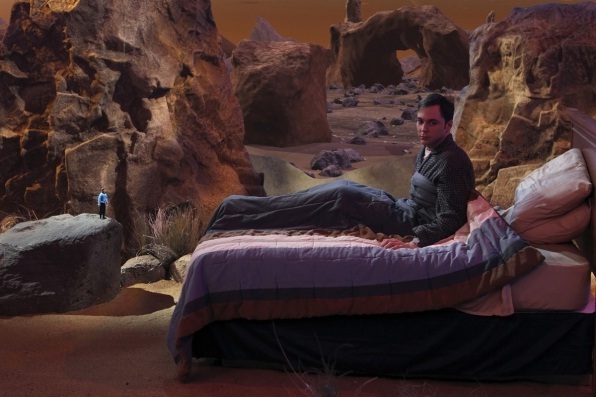 To Penny’s dismay, neither Sheldon or Leonard refuse to open their transporters and play with them because they’ll lose their value, until Sheldon has a dream featuring Spock — err, well, his Spock action figure (voiced by the real Spock, Leonard Nimoy) — telling him that it’s illogical to not play with something that’s meant to be played with. Sheldon succumbs and runs to the living room and opens his gift, but within a few minutes, he breaks it. He then does the “logical” thing and switches with Leonard, since he’s just going to keep his in the package, right? Well, the next day Leonard has a change of heart and opens his transporter (which is actually Sheldon’s) and finds it broken. This leads to a pretty funny exchange between Sheldon and Leonard, where Sheldon continues to make up lies, take them back, tell another lie, take it back, etc., until he finally tells the truth and apologizes. I’m always pretty happy to see Sheldon actually forced to deal with emotions (and the emotions of other people). So, that catch I was so cleverly alluding to above is, well, Raj’s potential wife is a lesbian. After Raj tells her how perfect he thinks they are together (and she agrees), she informs him of this fact, and Raj is shocked. But she’s surprised at his reaction because, mainly, she thinks Raj is gay and they are in a similar position. She assumes that Raj, like her, doesn’t want to have the conflict with her parents that would ensue if she came out, so she wants to marry another gay person and they can satisfy their parents’ wishes while living their lives. Raj totally isn’t gay though (he proudly says he’s metrosexual), despite the fact that he’s come across gay for pretty much the entire show, and especially this season. After briefly entertaining the idea of marrying a lesbian, Howard and Bernadette talk him out of it and buy him a puppy. Raj is thrilled. We have to wonder, is Raj actually gay? As I said earlier, we haven’t spent much time with his character and he could be figuring his sexuality out. This is an exciting potential storyline for the show, and I hope it’s something they continue to press, even if it’s not till next season.